Are you ready to get in the Christmas spirit? 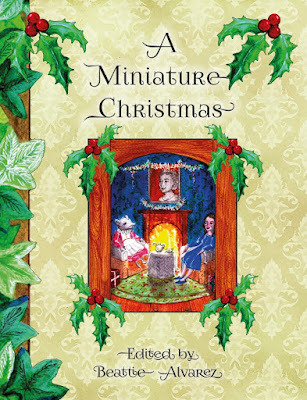 Here is a lovely collection of Christmas short stories, compiled by Beattie Alvarez at Christmas Press, all around the theme of ‘miniature’. Miniature has been interpreted in varying and delightful ways, with stories of fairies and elves, goblins and genies, mice and even little figurines. There are stories by some of Australia’s most loved story tellers, including Oliver Phommavanh, Pamela Freemen and George Ivanoff, as well as some fantastic stories by lesser known up and coming Australian authors. I love Oliver Phommavanh’s story about the little elf in an app that comes to life to tell Nathan how much fun he can get out of each toy he wants for Christmas. George Ivanoff’s story about a Christmas fairy trap is magical and Michael Grey’s reimagining of a Peter Pan ‘chrimbas’ is fun and authentic. There are also stories of figurines coming to life, twiglings creating their own Christmas surprise, a Christmas elf getting stuck in a vase and mice stealing Christmas dinner. The illustrations showcase a range of emerging talent, with each story illustrated by a different Australian illustrator to give it its own unique feel. They range from Jennifer Polan’s soft and gentle illustrations, to the fun cartoon style of Amy Golbach to the beautiful and distinctive styles of Penelope Pratley, Kathy Creamer, Sandra Severgnini and others. This collection of a dozen stories could be read to children as young as four, who will love listening to the stories and taking in the illustrations. Independent readers from around eight will be able to enjoy reading the stories for themselves. This is a unique anthology that brings together both established and emerging writers of children’s literature to create a beautifully illustrated Christmas collection. Thanks for such a beautiful review Sarah.